One of the most important features provided by RadGridView is the data validation. 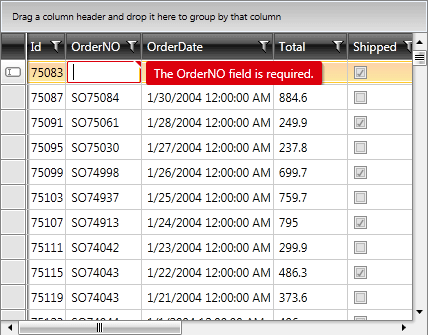 Data validation features enable you to take complete control of the data entered in your grid's cells. 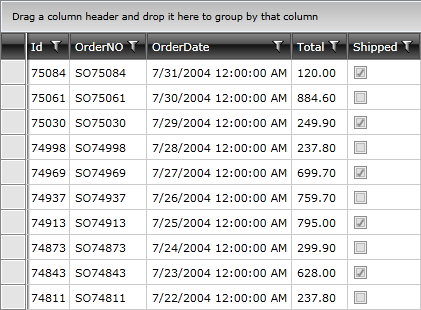 The purpose of this tutorial is to show you how to validate data using RadGridView. The data validation is controllable through events. Be sure you are familiar with all validation events exposed by the RadGridView. For the purpose of this tutorial, we will use the RadGridView declaration in Example 1. The RadGridView is populated with some sample data. None: Denotes that RadGridView will not perform any validation. InViewMode: Denotes that RadGridView will perform validation only in view mode. InEditMode: Denotes that RadGridView will perform validation only in edit mode. If the RadGridView is initially loaded with an incorrect value, no error messages will be displayed. Default: This is the default value. It combines the two previous ones - InViewMode | InEditMode. Setting the ValidatesOnDataErrors property will not affect the UI validation provided by the CellValidating and RowValidating events. Telerik.Windows.Data.INotifyDataErrorInfo interface was created for WPF 4.0. version since System.ComponentModel.INotifyDataErrorInfo was available for Silverlight only. If using WPF 4.5, please reference System.ComponentModel.INotifyDataErrorInfo instead. None: None of the validation mechanisms is respected. DataAnnotations: Only validation through data annotations is respected. IDataErrorInfo: Only validation through the IDataErrorInfo interface is respected. INotifyDataErrorInfo: Only validation through the INotifyDataErrorInfo interface is respected. Default: Validation through all three mechanisms is respected. The cell validation occurs when a GridViewCell is edited and its new data is about to be committed. At this moment, a CellValidating event is fired and since the new value is not committed yet to the underlying data object, here is the perfect place for applying a custom UI validation. Example 3 shows how to validate the OrderNo property of the Order object to be longer than 5 characters. Attach to the CellValidating event, which is exposed by the RadGridView. Switch to the code-behind and add your custom validation logic in the event handler. e.ErrorMessage = "OrderNO must be longer than five characters." 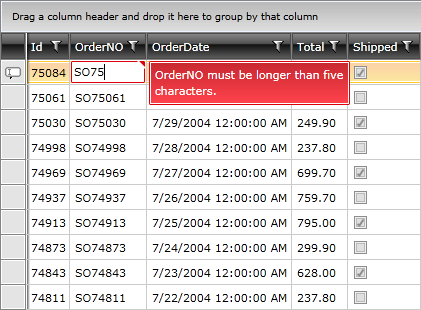 When you try to enter an order number that has fewer than five characters, you should see a validation message that is similar to the one in Figure 2. When you set the e.IsValid property to False, this will cancel the editing process and will return focus to the invalid GridViewCell. After this UI layer validation is successful (e.IsValid is True, which is the default value). Then the Data layer validation occurs. This is the validation that is built into the business object implementation. If the edited cell's column has a CellEditTemplate set, the e.NewValue argument will always be null. You can get the new value through the e.EditingElement parameter instead. An alternative approach is to use validation on a property level as shown in Example 4. In this case, you need to throw an exception when an incorrect value is about to be set. This results in a binding validation error (Figure 3) and the GridViewBoundColumnBase editor will enter into an invalid state. An exception of any kind will result in a validation error, and an exception message will appear as an error tooltip. In the previous examples, the data was validated per cell, using the CellValidating event or property validation. You can do the same thing per row, using the RowValidating event. The RowValidating event is very similar to the CellValidating event. However, instead of getting an individual cell, you are getting an entire row. Example 5 shows how to validate the OrderNO and Total properties of the Order object. Attach to the RowValidating event, which is exposed by the RadGridView. Switch to the code-behind and add your custom validation logic in the event handler as demonstrated in Example 6.
validationResult.ErrorMessage = "OrderNO is required and must be at least five characters"
validationResult.ErrorMessage = "Total must be positive"
In order to access the new values, you should grab the row's DataContext (in this case, it is an Order). For the old values, use the OldValues property. The GridViewCellValidationResult object is used for displaying error messages when the user enters wrong data. Figure 4 shows the result from a failed validation. Once you have added such errors, you will have to explicitly clear them when needed. Please check this help article for information about how to clear user defined errors. RadGridView also allows you to take advantage of the System.ComponentModel.DataAnnotations assembly. 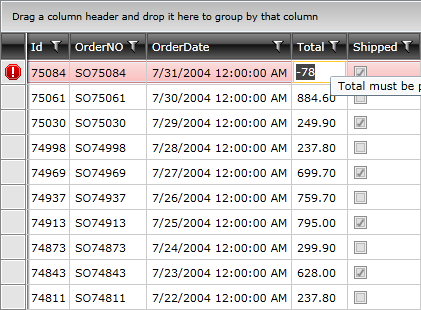 Example 7 shows you how to use DataAnnotations in order to validate the OrderNO property of the Order object. In order to use DataAnnotations you should add a reference to the System.ComponentModel.DataAnnotations assembly. RequiredAttribute: Specifies that a value must be provided for a property. RegularExpressionAttribute: Designates a regular expression to be used for validation of the associated member. StringLengthAttribute: Specifies the maximum and minimum number of characters that are allowed for an entity member. RangeAttribute: Designates the minimum and maximum constraints for the associated member. DateTypeAttribute: Specifies the name of an additional type to associate with an entity member. CustomValidationAttribute: Designates a customized method to execute to validate the entity member. You can see the result in Figure 5. Once the UI and Data validation is passed (i.e., the Binding tried to update the value for the bound property), the CellValidated event is raised. The ValidationResult can be valid or not. Here you can also add a custom logic like changing the visual state of the editor (through the e.EditorElement). For a general example on how to validate the data, you can check our Validation WPF Demos. You can also download runnable projects from our online SDK repository here; the examples are listed under GridView. Although GitHub is a very well-known platform, we saw a better and easier approach for reviewing our examples in our SDK Samples Browser. The SDK Samples Browser is an application that automatically connects to GitHub and downloads the XAML SDK repository locally to a location that could be set by the user. After download is complete, the application gives a very convenient navigation between all the available examples and a search functionality that doesn’t simply search by control’s names but also through the example’s names and descriptions.